By 2030, global population is expected to grow to more than 8 billion people with more than 60% living in the cities. In addition, changing demographics of people living longer than 65 years will nearly double . The challenge is to maintain people’s quality of life while maintaining (or improving) a city’s competitiveness while addressing the challenges of an aging population, scarce resources and climate change. With Smart Systems in Smart Cities, we can do more with less. The smart city is built on awareness and (some elements of) real-time control of all of the critical functions and infrastructure of the city. The citizens of the city and their “smart things” are key actors in enabling the smart city to do more with less. Another major factor is the significant improvements that have been made in the Price/Power/Performance trade-offs, in all the major semiconductor components such as sensors, microcontrollers, wireless transceivers and power transistors needed for smarter homes, and in the circuit topologies that can best exploit these advances. 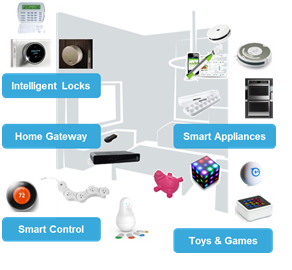 Moreover, the advances made by ST and other key technology providers have been complemented by the success of numerous consortia and partnerships in developing reliable, cost-effective international standards such as the communications protocols used for smart metering and home automation. ST even has its own recently launched SPIRIT1 transceiver for frequency ranges between 160MHz and 1 GHz. SPIRIT1 has gained good traction in the market because of its excellent power efficiency and easy “tune-ability.” Monitoring the Smart Home In the future Smart homes will be more energy efficient and safer because of a network of monitors and image-sensor cameras distributed around the home. Self-powered nodes will easily be positioned around the home for tasks such as temperature, CO (carbon monoxide) or movement sensing, relaying data wirelessly to a PC or STB/home gateway. The data could then be communicated to a mobile device such as a smartphone or tablet via a wireless router to enable monitoring and control. Meterlinq’sremote reading and remote management system is based on ST’s ultra-low power microcontrollers. It handles the communication between smart meters in households and the neighborhood data concentrator which relays the information to the utility-provider control center. 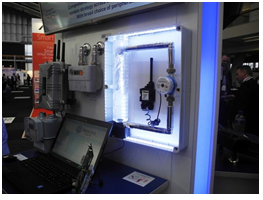 This is the result of collaboration and ecosystem development between ST, gas-meter manufacturers, system integrators, data-management companies and utility companies. Renewable Energy Sources The most promising renewable energy source today is solar power. Maximizing energy harvesting and conversion efficiency is critical to making solar energy competitive with fossil-fuel generation methods. STMicroelectronics’ trials using the Company’s latest 1200V silicon carbide diodes have shown a 2% increase in overall inverter yield, even when operating at high load and high frequency. Over the intended lifetime of inverters used in installations such as residential photovoltaic systems and high-power solar farms, this improvement can effectively save many Megawatt-hours of valuable energy. 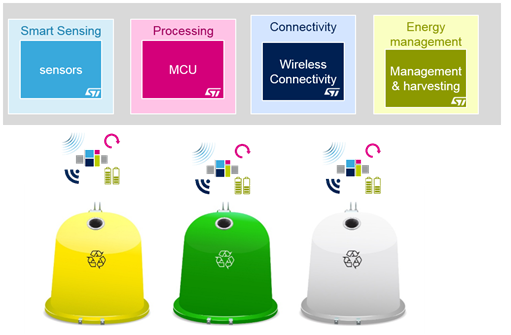 Smart Buildings ST has developed a fully automated system architecture based on a real-time communication network among sensors, plugs, power switches and the home controller. The building network uses the smart meter as the link between the external network of energy sources and the internal demand. Optimized energy management, based on dynamic energy tariffs related to peak- and real-time power consumption, will result in valuable energy saving while minimizing inconvenience to the final user. Smart Factory With manufacturing consuming more than 40% of global energy , making factories as energy-efficient as possible is a goal everywhere. Globally, multiple efforts are underway and all of them complementary. Industrial automation and manufacturing are going through the fourth phase of major change (after lean manufacturing in the 70s, outsourcing in the 90s, and automation in the 2000s). This phase, digitization, is driven by four enablers and ST has a hand in most of them. First are the advances in human-machine interaction such as touch interfaces and augmented-reality systems driven by progress in sensing technologies. Second is the rise in computing power and the ease and speed of connectivity, leading to an explosion in data volumes and the development of advanced robotics and 3D-printing, among others. Finally, the emergence of large-scale analytics and business-intelligence is opening new levels of understanding and productivity. One key program is "Industry 4.0." With its origins in Europe, it seeks to bring the advances of the computer revolution to the machines and processes developed in the industrial revolution. A similar undertaking is the Smart Manufacturing Leadership Coalition, which had its origins in the United States. 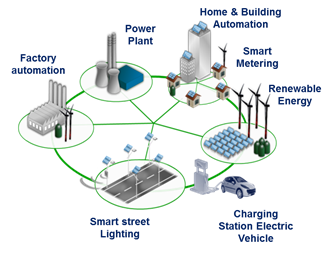 As with the Smart Grid, these initiatives aim to bring intelligence and inter-communication to factory devices; they envision a day when, for example, factory machines could predict their own failures and automatically trigger pre-emptive maintenance, or when a supply chain can be so closely monitored that factory output would change automatically in response to changes in demand. Smart Mobility According to new research fromGartner, by 2020 there will be a quarter of a billion connected vehicles on the road globally. Already, the number of connected cars coming onto the market is rising rapidly, with the likes of BMW, Ford, Mercedes, and Tesla - in fact, most of the world's leading car manufacturers - already offering some form of wireless online connection in their latest vehicles. Offering a simple and compelling upward-migration path from existing parts, ST’s automotive MCUs enable improved vehicle performance and economy with no compromises in security, while facilitating development with a powerful ecosystem and delivering savings by promoting hardware and software reuse. At the forefront of industrializing technologies that are essential to autonomous driving, ST offers SoCs for Advanced Driver Assistance Systems (ADAS), which raise driving safety by detecting obstacles around the vehicle including other vehicles and pedestrians, as well as traffic signs and lane markings to automatically operate brakes or control speed and following distance. In April 2015, ST announced new members in its multi-core microcontroller (MCU) family aimed at making cars safer. These new devices are the first to be launched with ST’s proprietary in-house 40nm embedded Flash process. The new automotive MCUs combine compliance with the most stringent automotive safety standards, encryption for security, and increased memory size for the storage of vital programs and data, strengthening ST’s product line of fault-tolerant microcontrollers for demanding applications throughout the car. These mission-critical applications include engine management, transmission, anti-lock braking, electric power steering, active suspension, and ADAS. MEMS sensors are inside many automotive products. Within ST’s AMS product group, the Custom MEMS division develops the sensors that enable applications that help us navigate and make our cars safer. ST was also recently recognized by IHS , the leading global source of information and analytics, as the leader in automotive sensors for navigation and telematics, as well as the fastest growing automotive-sensor supplier worldwide Smart Healthcare Semiconductors have been used in medical equipment for over four decades but, until recently, this represented just a small part of the industrial electronics sector, mainly dedicated to equipment for use in hospitals and clinics. Today, thanks to the ever-increasing pervasion of microelectronics technology, the traditional medical electronics market has been transformed into the broader and fast-growing health and wellness market, in which people are taking more and more responsibility for their personal health and fitness.